Last weekend I met up with Shelli of Shelli Can, she makes cool flair and things to wear for fiber folks and she’s local! 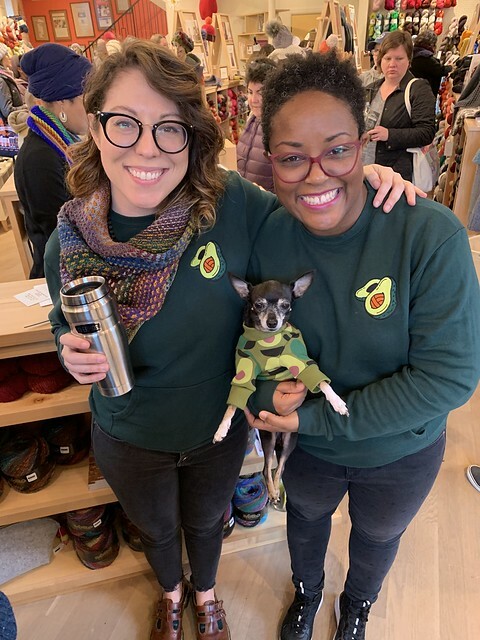 So we met at Fibre Space for a weekend event they were having and I told her I’d wear the ‘Avo Yarn Problem’ sweatshirt I bought from her so I could show her Jellybean’s avocado sweatshirt too. I usually buy her one or two really nice quality sweatshirts to last all winter and I love the ones from Sir Dogwood. They also make this sweatshirt in a hoodie and a onesie version. I adore the modern and cute clothes. Also, Jellybean’s poses kill me. I know it’s silly but man it makes me smile and that’s all that really matters. So I thought I’d share and make you smile too. Have a great weekend! You did make me smile, and Lord knows this world can stand a lot more smiling. 😀 Thanks for sharing. My dog left this world in December, and seeing you and your dogs has been especially great lately. I know that we will eventually get another dog, when the time is right. And if it’s a short hair breed that needs a sweater, I’ll know where to look. zOMG! Jellybean is ADORBS! It makes me wish my Sophie-dog would wear sweaters and shirts. Sophie-dog is labby-coated 65-pound Labradoodle. She gives sweaters the look of tolerant disdain at best. Maybe I should just make myself an avocado print skirt or something. Your smile and your sweet dog’s clothes and poses really warm up this cold day. Dogs in sweaters is just about the best thing ever! Jellybean in an avocado sweater??? This is the best part of my day. Thanks for posting! IS that dog model furr real on Sir Dogwood website? It looks like a lil stuffed toy. Someday you might need to post Jellybean’s closet photos. Have a wonderful weekend! Yes that dog is real! It’s so adorable. Oh gosh, ditto! I can’t ever recall not having avocado slices, avocados in salad, mashing them to make guacamole, and especially avocado toast. My sis-in-law, originally from Tennessee, still remembers her first taste of avocado when she and my brother were dating in high school and mom gave her avocado toast one afternoon. That was 60 years ago and she loved it. Dana, the sweatshirts are adorable! Ahhh! That smile! That does make my day a little brighter. Thank you! Jellybean is a fashion maven:) I love seeing what she’s wearing! our local toy stores have stuffies that look like avacados-many sizes too! I’m here for the dogs, so keep it coming! 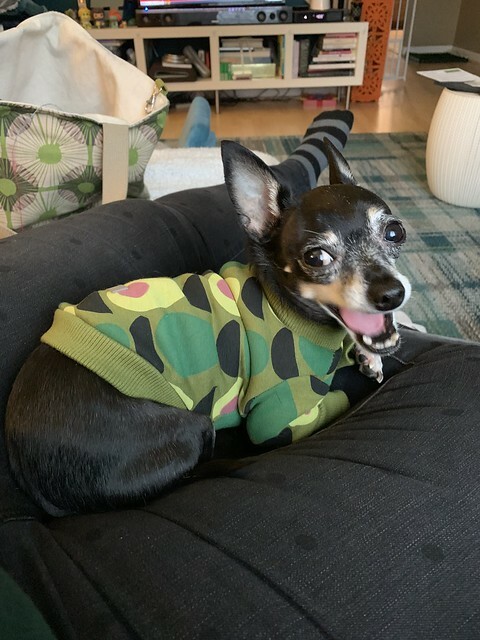 Ok, also my dog needs a new sweater.